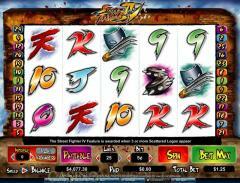 Have you tried the new video slot game, Street Fighter IV, from Cryptologic? This game epitomizes the high quality and great game experience generally offered by this provider of online gaming software, with five reels and twenty five pay lines of super slots action. Street Fighter IV is based on the arcade game of the same name - in fact, the game is a sequel that was released after the immense popularity of the first game to be based on the original arcade game. The theme is supported by well created icons, and the graphics and sound are very good. The software, as is to be expected from Cryptologic, runs smoothly and well. The symbols in Street Fighter IV go well with the theme of the game. Some of these include the Yin Yang wild icon, the Street Fighter IV logo scatter symbols and the Hat. Interesting animations, in addition to the high quality graphics, make playing Street Fighter IV even more fun - it is not surprising that the game, despite its very recent launch, is already gaining a fan following. 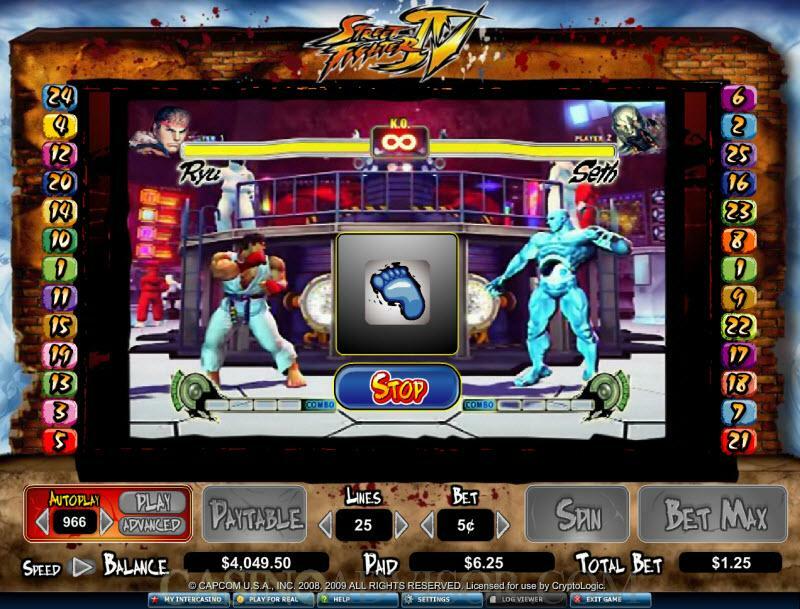 Street Fighter IV takes its inspiration from version 4 of the original arcade game. There are thirty six possible winning combinations in this slot game, which features a wild symbol as well. A player gets to pick his or her own fighter character from the various options - Ken, Ryu, Chun Li and Abel. Coin sizes in the Street Fighter IV slots game vary between $0.01 and $20, so both high rollers and those who prefer lower stakes in online gaming enjoy Street Fighter IV. The maximum number of coins that can be wagered is 25. The wild symbol in this slots game is the Yin Yang icon. This symbol can only occur on reels two and four. The Yin Yang symbol can replace other symbols (besides the Street Fighter IV logo scatter symbols) in order to create winning combinations. 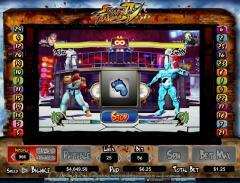 The big jackpot prize in Street Fighter IV is worth 5000 coins. This is earned when a player gets five hat icons on an enabled pay line. If the minimum bet is placed for a jackpot win, the prize would come to $50; with the maximum wager, the jackpot amounts to $100000. So those who have an eye on winning the jackpot should always place the maximum bet. One of the best things about the Street Fighter IV slot game is that the bonus game is very appealing. This bonus round is triggered when a player gets at least three scatter symbols (Street Fighter IV logo icons) among the reels. Winning a fight with the fighter icon you have selected could earn you one of a variety of extra bonuses, based on how you won. The good bit here is that even if you lose the fight with your opponent on the screen, you still get a reward - of ten complimentary spins. Interested in reading more detailed information about Street Fighter IV? If so Click Here for more details.